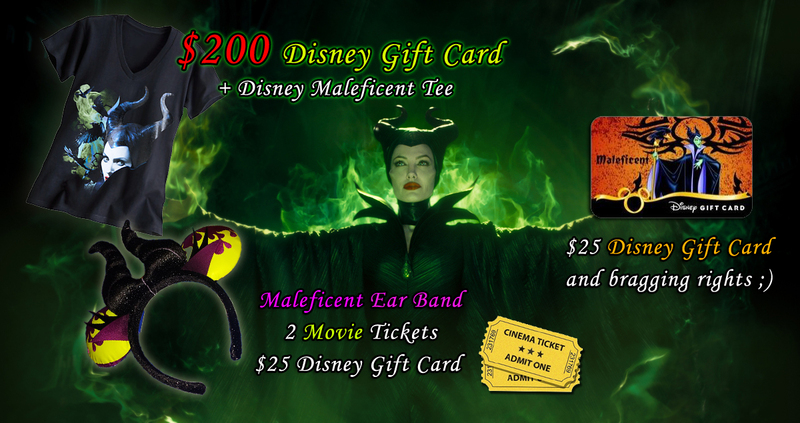 May-leficent Giveaway: Win $200, Maleficent Mouse Ear Band, and More!!! FIRST Prize: WIN $200 and an official Disney Maleficent T-Shirt! Remember, you do not have to “like” all the pages, it is solely up to you whether “like” them or not. Enjoy! This entry was posted in Disney News, Entertainment, Freebies, General, Giveaways and tagged disney, giveaway, Maleficent, may-leficent, mayleficent, villain by My Disney Cloud. Bookmark the permalink. Would love to win! Maleficent is my favorite! Thank you so much for the chance!! I would love to win this!! How exciting! Wish me luck! Thanks for the opportunity to win!! Would love to win this! Can’t wait to see the movie!! I want to win this one so badly. Maleficent has always been my absolute favorite Disney character! Can not wait to see this movie!! It looks fantastic and I would look pretty good too wearing the short or ears :). Thanks for the opportunity!! Love this giveaway it’s awesome!